PDFtext - Dlls for your pdf-files... Royalty free! All pdf-specs! Extract the complete text-content of pdf-files. As an automated text-export into a generated file. As clipboard-content. As a returning string. For all well known IDEs (.NET, too!). PDFtext - Dlls for your pdf-files... Royalty free! For all pdf-specs! As 32- and 64-bit! 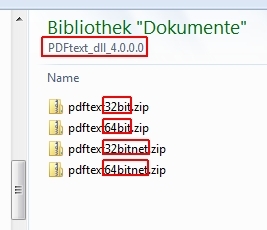 With this dll you can get the complete text-content out of your pdf-files. To do this you can use three ways: As an automated text-export into a generated file. As clipboard-content. As a returning text-string. You can use it with delphi, vb(a), vbxxxx Express, C#, C, C++ and all main programming IDEs (.NET, too!). Helps improve admin time and deployment time. Consolidates a lot of SQL Server admin and debug features into one program. Great tool for MSDE admins. Could be used like a substitution for EM and QA. EasyQuery.NET Silverlight: an unique set of components which allows you to include end-user-oriented query builder into your Silverlight application and provides your users with a natural language interface for their database requests. dotConnect for QuickBooks is an ADO.NET provider for working with QuickBooks data through the standard ADO.NET or Entity Framework interfaces. Multi-threaded C# and VB.NET scripting runtime environment for building applications with the ease of running a script from the command line.